Habit at Enchanting Floral Gardens of Kula, Maui, Hawaii (USA). March 01, 2012. Habitat: It is quite uncomon in tropical rain forests and cloud forest, but can be found in locally abundant colonies often completely covering the branches of a tree, more commonly throughout the middle to upper canopy but also rather close to the ground; will survive on the ground for a while if it falls from tree. It is also found in the hammocks and Taxodium swamps of southern Florida. This species flowers mainly (but not exclusively) in the late dry and early rainy seasons and the fruits mature during the following dry season. Guzmania monostachia is a “tank forming” bromeliad on which the rainwater accumulates in external tanks (phytotelma) formed by the overlapping of the leaf bases, allowing the plant to draw upon their water reservoir during periods of drought. Moreover, the presence of epidermal trichomes on the leaf surfaces ensures an efficient way for water absorption in most air conditions. This epiphytic tank bromeliad shows a high capacity of acclimation in response to variations in the natural environment. Description: Guzmania monostachia is a glabrous spineless “air plant” (epiphyte) that grows attached to tree trunks and branches often with several plants in dense clusters. Monostachia means "one-spiked", referring to the single spike of many flowers. Stem: Very short and thick. Rosette: Often broader than tall up to 40 cm high and 60 cm wide, with about 15-50 radially spreading leaves overlapping at the base and forming a cup that holds water. Leaves: Ligulate, nearly parallel-sided, acute to acuminate, (15)30-40(-50) cm long, 2-3 cm wide except at the broadly ovate base and glabrous at least in age, bright green (occasionally striped). Sheaths pale or darkened toward the base, ovate. Blooming season: Usually in cultivation it flowers in the spring and summer's warmth months peaking (in northern hemisphere) during the months of May, June and July. A rosette usually reaches the flowering size in three to four years. Fruit: Capsules 2-3,5 cm long, narrowly pointed at apex; valves rough and brown outside, shiny and black within. Seeds: 1.5-2 cm long, the seminiferous area ca 3.5 mm long, darkreddish-brown, the coma (a plume-like appendage) fused midway and reflexed back to seed, the refolded part not fused to the seminiferous area. Remarks: Guzmania monostachia can be distinguished from other airplants and bromeliads by its short, dense, unbranched flower spike with broad, conspicuous bracts covering the flower stalk. 1) Wikipedia contributors. "Guzmania monostachia." Wikipedia, The Free Encyclopedia. Wikipedia, The Free Encyclopedia, 21 Aug. 2014. Web. 17 Sep. 2014. 2) Forest & Kim Starr Guzmania monostachia (West Indian tufted airplant). Plants of Hawaii. <http://www.starrenvironmental.com>. Downloaded on 16 Sep. 2014. 5) Oxford University Press "Flora of North America" volume 22, 2000. 6) Davidse, G., M. Sousa Sánchez & A.O. Chater. “Alismataceae a Cyperaceae.” In G. Davidse, M. Sousa Sánchez & A.O. Chater (eds.) Fl. Mesoamer.. Universidad Nacional Autónoma de México, México, D. F.1994. 7) Foster, R. C. “A catalogue of the ferns and flowering plants of Bolivia.” Contr. Gray Herb. 1958. 8) Gilmartin, A. J. “The Bromeliaceae of Ecuador.” Phanerog. Monogr. 4: 1–255.1972. 14) Maxwell, C; Griffiths H; Young AJ "Photosynthetic acclimation to light regime and water stress by the C3-CAM epiphyte Guzmania monostachia: gas-exchange characteristics, photochemical efficiency and the xanthophyll cycle". Functional Ecology 8: 746–454 1994. 15) Gilmartin, A. J. 1972. "The Bromeliaceae of Ecuador." Phanerog. Monogr. 4: 1–255. 16) Krömer, T. 1999. "Checklist of Bolivian Bromeliaceae with notes on species distribution and levels of endemism." Selbyana 20(2): 201–223. 17) Gilmartin, A. J. 1972. "The Bromeliaceae of Ecuador." Phanerog. Monogr. 4: 1–255. 18) Gil Nelson. 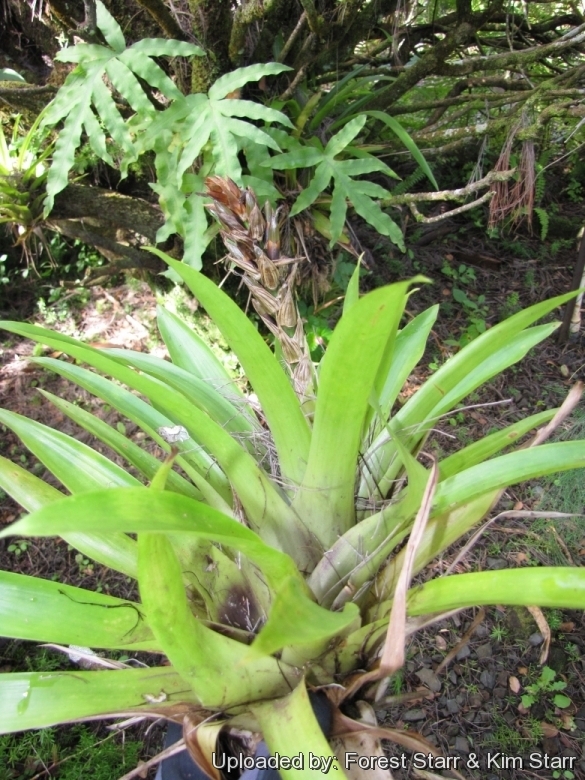 "FUCHS' BROMELIAD. Guzmania monostachia" <http://www.fnai.org/FieldGuide/pdf/Guzmania_monostachia.pdf> Florida Natural Areas Inventory2000 Web. 17 Sep. 2014. Cultivation and Propagation: As Guzmania monostachia is native to rainforests, cool evening temperatures with warm days and high humidity describes its best growing conditions, however it grows very well as a home plant too. Individual plants live three to four years. 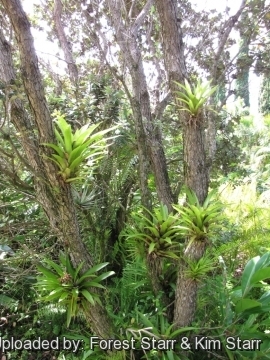 Growing substrate: This bromeliad grows as an epiphyte or saxicolous and requires a well-drained, aerated, porous and moisture-retentive substratum which is rich of organic substance, but best results are obtained when it is grown epiphytically and roots are covered with moss or coarse crushed tree fern fibre encased in a container or wired to the surfaces of boulders, rough bark, rock walls, or tree branches. Living among the branches of the south American rainforests bromeliads need very little root space so do not place in too large a pot. Root rot can be a problem if the soil is too moist. Continue to depot annually in the spring until the bromeliad fills a 10-15 cm pot. Small pots can induce blooms in mature plants. Exposition: Grow guzmania in bright filtered light both indoors and out. In the garden it prefers partially shaded areas and grow best where they'll get morning sun, or shifting shade throughout the day. It adapts very well to deep shade and dim interior rooms, surviving well on fluorescent lighting alone. Low light often intensifies the bract colors that develop. Watering: It enjoys constant moisture from rain or sprinkler. In dry and hot climate, humidity can be increased with nebulisations utilizing water at room temperature and not calcareous. In summer, some distilled water can be left in the central cavity formed by the rosette of leaves, renewing it frequently to avoid the formation of a mosquito larvae nest, whilst in winter it is better to leave it dry, thus avoiding possible rottenness. Keep humidity up by misting. Requires complete and perfect drainage. If you have one that is not flowering then keep very warm in the spring and water sparingly. To remove excess salt build-up, leach bromeliad pot once during the summer. Hardiness: It must be grown in a frost-free situation in open air in the tropical and humid subtropical climate countries, with temperatures which it is good to keep over the 14°C, best 20-24°C. Use: Use it as a houseplant or patio container filler, or under tropical shade trees as a groundcover or accent. Display on a windowsill that receives bright, indirect light. Propagation: When the flower spike fades (6 weeks or more after it appears), pups appear near the base of the plants. When the offsets are 7.5 cm tall, they are ready to be repotted. Be sure to provide high humidity for a month after propagating the offsets. It may also be grown from seed: remove seeds from inﬂorescence and lay them uncovered on a bed of crushed tree fern fibres; keep constantly but moderately moist. Starting from the seed, 5-6 years are needed for the blossoming, whilst at least 3 years are needed by division. The wide scale reproduction for commercial purposes is done by micro-propagation.